In the 2007 rallies, about 50,000 protesters took to the streets in downtown Yangon near the Theingyi market. Although it was a peaceful gathering of monks, the crowd was beaten black and blue by the police, who used brute force, fire engines and poisonous insect spray to disperse the freedom fighters. Protesters scattered for their lives only to reconvene at Sule, as well as at the Shwedagon Pagoda. There were reports of death by being burned alive. To discourage more protestors from coming in, the police prohibited public buses to pass by the pagodas. The police then surrounded and cordoned the pagodas, which were the main focal points of the demonstrations. But there’s more to this pagoda than just a political hotspot. 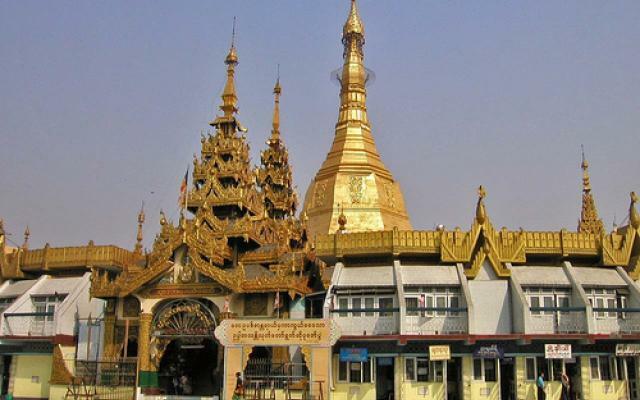 Today, the Sule is included in the Yangon Heritage List, serving as an important prelude to the larger Shwedagon Paya complex. The two pagodas, which are often compared, are both of Mon origins with four entrances that face north, south, east and west directions. The four compass points actually represent the historical incarnations of the Buddha. Found at the western entrance is a magnificent golden idol enshrined in a glass and golden leaf enclosure. While Shwedagon is considered the “spiritual heart of Yangon”, Sule is the human center of worship. The road leading to it is a dead end and bustling with common folk and street vendors. A series of shrines circles the pagoda’s all-important dome; each ring honoring a different deity and assigned to an astronomical sign. The circular pathway around the stupa is symbolic of one’s journey around the universe or the celestial sphere. There are smaller shrines that honor Buddhist deities that make up the Buddhist pantheon. Devotees and worshippers enter these porcelain, silver and gold shrines to offer foods or flowers to their gods. The exact time of the Sule Pagoda’s construction could not be exactly determined since it has undergone so many reconstructions in the past. This uncertainty has given rise to many legends and mythologies regarding the pagoda’s origins. A famous legend tells of a Sularata, powerful “nat” spirit, who was supposed to be the original resident of the pagoda. Sularata was an old spirit, so old that he needed props to keep his eyelids open. He helped the Nat Spirit King and the legendary King Okkalap to build a pagoda that will enshrine the Buddha’s strand of hair. The pagoda was supposed to be build at the exact location where three sacred Buddhas have buried other sacred relics in the past. Only Sularata knew the exact spot on which the pagoda must be built. Today, Sule’s dome enshrines the relic-hair of the Buddha. In the 19th century during the British rule, city engineers laid out the city in such a way to place Sule Pagoda at the center. The ancient pagoda is octagonal in shape, measuring 7.3 meters on each side. It is about 44 meters high, making it a truly scenic and important landmark in downtown Yangon.